This next part of our journey would prove to be an adventure of its own. We had our minds set on cycling to Tawang, a Himalayan hillstation where India meets Tibet. Before we would even get close to the Himalayas we would have to cycle through wet jungles and dusty mountain roads under construction. 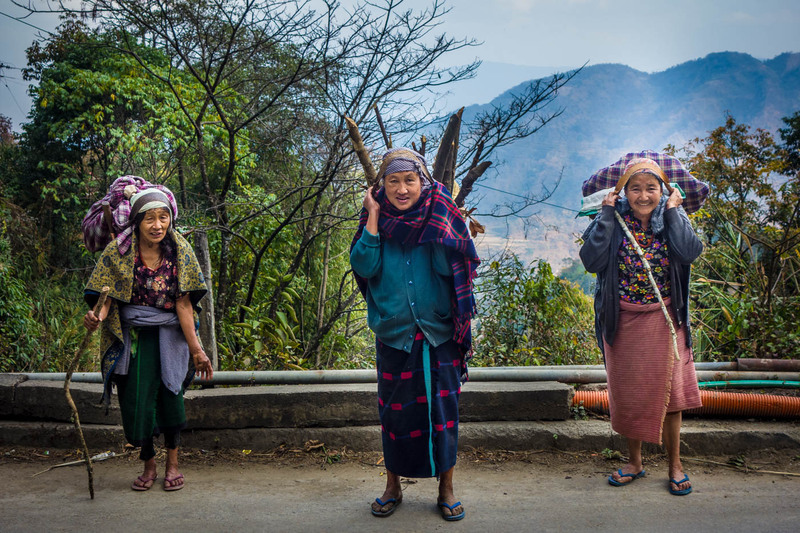 See our images here: Ziro to Rilloh, Rilloh to Bomdila, Bomdila to Jang and Jang to Tawang. 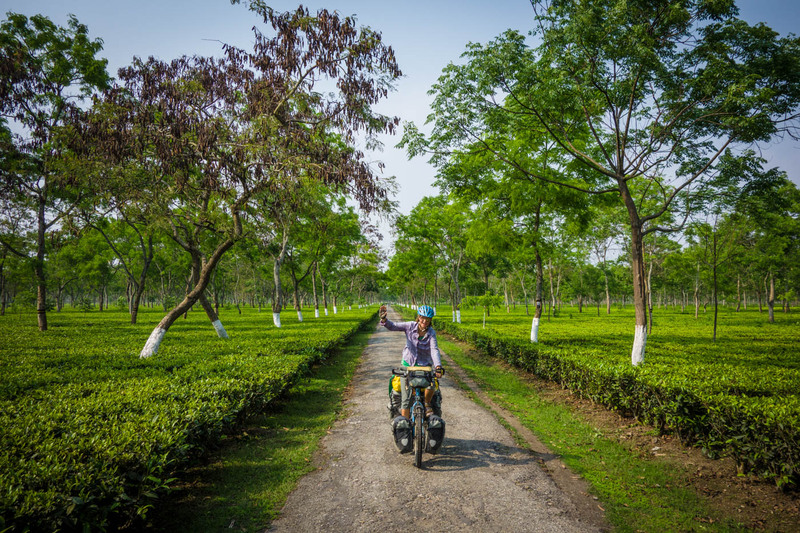 After a day’s rest in Ziro at the Blue Pine Hotel where we posted our last blog post from Arunachal Pradesh Zero cycling, we were ready to hit the road and make our way to Sagalee. While cycling out of town we went past a small parade of people going to church, most of the women in the parade had the facial tattoos of the Apatani tribe, this was quite a sight and we took a few photos of the moment. Monsoon is just on its starting points and most days have some rainfall. The rain made us take it slow and our state of mind too, so we made it a short day out of Hapoli (Ziro) and found an IB house at a hydropower station (NEEPCO) where we could spend the night nice and dry. An IB house is a government run Inspection Bungalow. These exist in many towns in Arunachal Pradesh and probably also other states. It is possible to stay at these bungalows for a small rate although the quality can vary wildly (we have paid between 100 rp to 500 rp). We took a shortcut which Bertrand had recommended us and it proved to be quite a shortcut. As the Indian government is working on a national highway through Arunachal they have prepared some sections and this was our short cut. Did we mention that it had rained the last days quite a bit so this road or 18km mud track gave us a good workout. We reached a village on the other side called Kheel and there was an IB house where we paid 200 Indian rupees equal to 3€ for the night so again out of the rain and had some visitors from the village coming for a chat. We cooked up a nice meal as we needed a change from the local dishes of dhal and rice. A new road had been promised to us by fellow cyclist Andrew and some people along the way. However we weren’t aware of a steady process of works on the road that also had become very muddy because of nightly rainfall and it was slow going to reach Sagalee. After this nondescript town the road became new, smooth and easygoing. We stopped at a nice Nishi tribal village to see if we could camp as we had passed Sagalee earlier and hoped to reach the next IB house. Luckily they invited us into one of the homes in the village and made a room available to us. We shared some small conversation with two younger men, a teacher and an art school graduate they made sure we had a great evening and the woman of the house cooked a nice meal for us and gave us great ginger tea. The road is under construction and some parts were great where other just a muddy mess and then the road ended. We had some info on the road as there are no correct maps of this region even Google has it wrong. Andrew had cycled past here a week before us and had written us some tips so we made it across a 1500 meter pass to Pakke-kesseng a small town at the end of the new road. We asked around and people directed us to the bridge and made sure we understood to turn right at the bridge. Bang! A steep jungle road/track connecting to the old road with incline of 800m up to 2000m (a pass we hoped to have missed because of the new road cutting through, how wrong we were….) and down again nothing new from the last few days of cycling. The road was almost overgrown and only a few Sumo’s and motorbikes went past us. The roads in Arunachal keep on being unpredictable and we never know what to expect. Again we found the IB house and had a great rest in the village of Rilloh located in an open valley in between the dense jungle and mountains. We left the next morning early as we wanted to reach Seppa and stay there for the night. We went to the local tea house and had a cup of tea and a rice pancake and cycled off. After having followed a river up the valley we were met by the choice of a longer road to Seppa or a shorter. We took the latter and enjoyed cycling down into a valley and out again. In this valley we went past some villages with some impressive long houses and a bit of a different feel to the people. The road up again was under construction but the sandy surface was sturdy enough to not slow us down too much. To our surprise we reached a new section of the national highway going to Seppa and we enjoyed a great downhill, very fast and smooth and reached Seppa in the early afternoon. It is funny how it goes with places that you have no idea of how it will be. For days now we had been telling people we were on our way to Seppa as the main question which people ask us is: “Where you go?” Because of talking about it so much expectations grow. We had heard that it was the day of Holi and indeed we were met by a group of colourful people that really wanted to share some colours. We got away with a pink spot on the forehead and went in search for a hotel for the night, after some searching we found the Circuit house of Seppa and convinced them to let us stay. Sadly the nice road leading us in to Seppa turned in to a dusty madness leaving Seppa and we had to keep our spirits high and pushed on. The scenery had changed and we were now following a massive and fast flowing river and great green mountains around us this helped us and we enjoyed the road more. In Arunachal the road either goes up or down and we knew there was another pass coming once we had crossed the town of Bana. We started cycling up and found a town with an IB house to our surprise. The first shop of the village invited us for tea and while we were sitting there two men came to have a chat with us. They were stationed here to work on the construction of the main National Highway 13 and had responsibilities for the 311 section of road that we were crossing from the shortcut we had taken before Kheel until Nechipu. It was interesting to learn more about the construction of the road. Another dusty climb and slowly we were reaching the point where our road would reach the main road from Bhalukpong to Tawang. We reached Nechipu and started heading down this steep descent. Just 5 minutes after reaching the road a Sumo came by with two bicycles on the roof. It was a German couple who had cycled up to Tawang and were on their way back. Down near the valley we started looking for a place to sleep but the options weren’t very appealing to us. Just after the checkpoint we stopped in Kaspi and asked if we could sleep somewhere. We were helped out by someone opening up the building across the street which was a closed fooding hotel and we set-up our tent inside and had a great quiet night sleep. The next day Bomdila would be waiting for us. 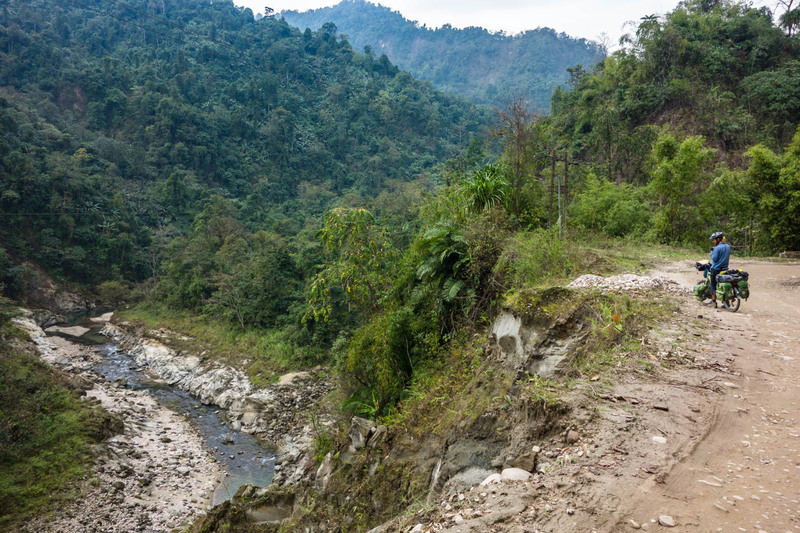 Since we had met with the main road the gradients had been steeper than we had been used to in Arunachal and especially along the river in the valley the road had some sweeping ups and downs. Just before the roads leaves the river behind the first bend is enormously steep and Susanne almost lost her conviction she wanted to do this. Luckily this was just a tough starter and most of the next kilometres up were a lot more gradual. Along this main road the military presence has grown again with military camps every few kilometres and some lined up next to each other. Military convoys regularly pass us on the roads and we stop to give them way. Also fast driving Sumo’s going back and forth to Tawang are a strong presence on the road and are heavy on the horn. Luckily there is enough peace and quiet to enjoy the road and not be too worried about the traffic. The scenery had definitely changed. From lush green jungle we had now arrived in a more dry environment with pine trees. The villages were changing and prayer flags were showing up. Some houses were made of stone and wood instead of bamboo. Along the main road there were small villages where you could stop for tea. Birds of prey were visible in the skies and frequently on the road we would pass prayer wheels situated on corners looking out over the valley. We had made a realistical planning for approaching the next few days to Tawang also with info from Andrew. In short we would cycle down to Dirang, up the first part of the pass to Sange, from Sange over Sela pass to Jang on the other side and from Jang to Tawang in four comfortable days. We left Bomdila and dropped down towards the valley and a beautiful river. Along the way Martin had stopped and he had come across two sets of puppies, 8 in total that must have been dropped by people not wanting to raise them. We fed them some bread but couldn’t take them with us although we really would have liked to. In Dirang there was a festival of speed on so all accommodation was fully booked. We left town and found a nice homestay just outside of town before the hot spring. The mother invited us in and soon we were chatting with the youngest daughter Lamu who spoke English. We both got dressed up in traditional Monpa clothing, went out with Lamu to see the hot spring and the river in the valley, shared some images of our journey and then Lamu asked Susanne if she wanted to go out for a ride on the ‘scooty’. So she hopped on and was whisked away to the next village where a cousin lived and then unto the next town with info about all the places along the way. It was a fun afternoon and by the time it got dark we all huddled together in the kitchen around the fire. Slowly we rode out of the valley and were hoping to find a tea hotel for a morning snack. This did not come as easy but luckily just before the start of the real climb a military officer pointed us out that we could have breakfast at the Non CSD. We don’t know what it stands for but were happy with egg patties and complimentary tea from the military. From here switchbacks started. We have never been on this many switchbacks before! The road just keeps on winding up and up. We saw our first snowy mountain peaks in the distance and were getting excited about what was to come. We knew we could find a resthouse in Sange and found the place mid afternoon. The town itself was just below the resthouse so there was no teahouse but we could find some vegetables to make ourselves a hearty meal. Riding out of Sange was tough because we hit the switchbacks straight away and with a cold body, fresh morning and adjusting to the altitude, Sange sits at 3000 meters, it is never easy. Sun and cycling was slowly warming us as we were weaving ourselves up the mountain and now we could see the switchbacks on the next mountain where we were working ourselves towards. We were feeling the altitude and the quality of the road was slowly deteriorating. It felt as if the sun would win it from the clouds and the mist but end morning clouds were rolling in again. It was getting fresh and at around 4000 meters light flakes were falling from the sky. We did a final push and made it to the top of the pass where we had some photos taken by a military officer who was holidaying with his family. There was a small cafe at the 4200 meter top with tea and samosa’s so we took the chance to warm while the hail started plummeting down. The other side of the pass looked dark and grey although the mountains still stood out as stony jagged edges. We were fully dressed for cold and rain and it was worth it. We crossed the lake and went down the few muddy switchbacks and then followed the stream downwards. It was an excruciatingly slow downhill with rain, hail and bad road surface. As we have seen before women were working on the roads and at some points breaking stone with hammers on most of our way down. We found another military rest point with tea at the memorial and headed down the final hairpins to Jang where our permit was checked and we found a place to stay at Gombu lodge (overpriced and not so welcoming). We ate food at Laxmi fooding hotel which was very nice and we could sit in the kitchen next to the fire to warm ourselves. We had made it all the way to Tawang valley! We have crossed our first large himalayan pass! Tawang valley is huge and we were impressed by the scale and the scenery. We had a quick visit to Nuranang (Jang) Waterfall and made our way up to Tawang. Because when you have reached this valley it doesn’t mean you are in Tawang. The lowest point is 2000 meters and Tawang as a Himalayan hill station lies at 3000 meters. Which means the only way to get there is to go up again. We passed through small villages, met some nice locals along the road and started heading up to Tawang. We went passed the birthplace of the 6th Dalai Lama and crossed Tenzin guesthouse which had been recommended to us. We felt it was a bit too far out of town so we made it up the last steep sections to reach the old market of Tawang. All the time we had the views of Tawang Monastery in the background. As said before when reaching a place we always have expectations. We try not to, but we are only human. Sometimes a place leaves us gobsmacked because it is so much more than we have ever expected, sometimes a place does not completely live up to the expectations. We keep an open mind. Also we feel now we have travelled for a long time that our eyes and mind are not as fresh as they might have been before. We had lived up to Tawang and crossing Sela pass, had lived up to being in Tibetan Buddhist surroundings and being among large mountains and feeling strong traditions because of the remoteness of the place. Don’t get us wrong. Tawang is special, interesting and the surroundings are beautiful. But… having travelled to Tibetan areas in Gansu, Qinghai and Sichuan provinces of China we had maybe put our expectations too high. Have a read of back then in China. Tawang district is a nice place, we just couldn’t find the spirituality and the traditions as strongly as we were looking for, that being said we enjoyed the surrounding views and the interesting touch of this hill station. 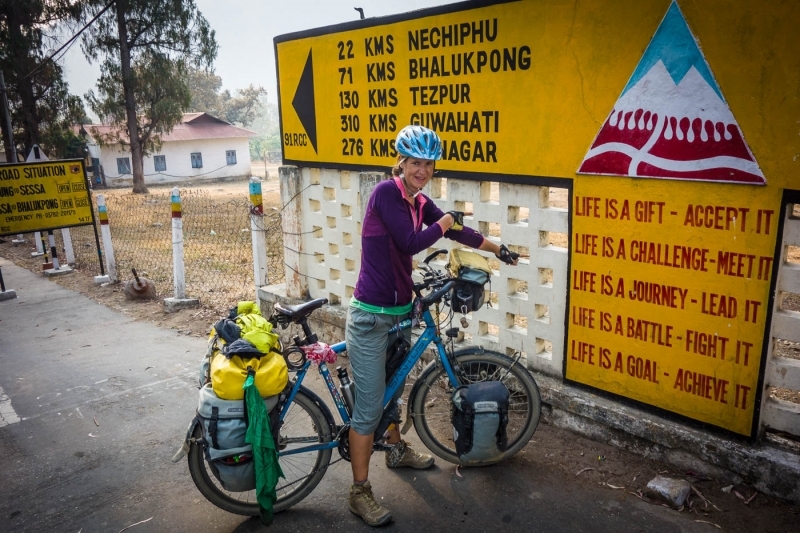 It is unique that we are finding ourselves approximately 10 km from Bhutan and 15 km from China in a straight line and that we have made it to the Himalaya by bicycle!! We used a morning walking up to the Tawang Monastery which is said to be the second largest monastery of Asia, how and who has agreed to that we do not know. We enjoyed walking the narrow streets and greeting the young apprentice monks. We try not to compare but we did not feel the intense feeling of traditions and religion as we did at the Labrang monastery. We met a nice monk and had a small chat but we did not have the chance to understand more of the history. As you might know the current 14th Dalai Lama chose to escape Tibet in 1959 due to the Chinese rule of Tibet, he fled to India and he crossed the border just north of Tawang at Bumla and did spend some time at the monastery, this history has many sides to it but it did give some extra excitement to being here. Just as we were leaving the monastery we were met by an elderly woman on a pilgrimage, we could not communicate much but we enjoyed the moment and shared a photo opportunity. What an amazing travelogue! Not to mention the pictures. About the switchbacks, and the photos that you’ve included, are they steeper than they look, or are fairly representative of them? Hi Martin (en Susanne natuurlijk ook), Wat een fantastische reis maken jullie. Met enige regelmaat kijk ik ff naar de foto’s, die ook erruug mooi zijn. Indrukwekkend. Hier is alles prima. Af en toe moet ik nog wat schrijf werkzaamheden verrichten voor de EVA (je weet nog wat dat is? ;-). Gezond en veel werk. Groet, Gert Zwart.